Jim Converse hoped to get back to the majors in 1998, but his time at AAA Rochester started slowly. He didn't get his first win of the year until July, starting the year 0-8. The win actually marked his first since early the previous season, according to The Rochester Democrat and Chronicle. "It's been on my mind," Converse told The Democrat and Chronicle after his big victory. "You think about it when you go home: 'I'm just never going to get a win.'" Converse picked up two wins that year and five the next, but, after spending parts of four previous seasons in the majors, he never returned to the majors. 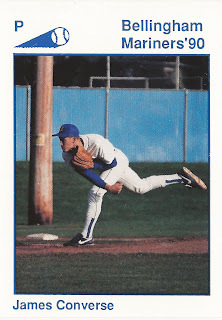 Converse's career began in 1990, taken by the Mariners in the 16th round of the draft out of Casa Roble High School in California. Converse started with the Mariners at short-season Bellingham. He went 2-4 over 12 starts, with a 3.92 ERA. He moved to high-A Peninsula in 1991, then AA Jacksonville for 1992. In May 1993, he debuted in Seattle. Converse got four starts for the Mariners that year. He went 1-3, with a 5.31 ERA. He returned for another 13 outings, eight starts, in 1994. He went 0-5, with a 8.69 ERA. He went 5.1 innings in a July game against the Yankees, giving up nine hits for a no-decision. Converse played 1995 between the Mariners and the Royals, sent mid-season to Kansas City in a trade. He gave up eight earned in 12.1 innings of work for the Royals down the stretch. He picked up four outs in a September win. Converse lost all of 1996 to a right shoulder strain. He made it back to the bigs for three final outings in 1997. He gave up two earned in five innings of work for the Royals. He played three more seasons in the minors, including a season in independent ball, to end his career. In 2012, he entered his second season as junior varsity head coach at Valley Christian High School in California.